Dr Vanessa Webb – Medical Director of Mountain Healthcare Ltd. The Advanced Clinical Forensic Practice Competencies document is a formal record of the student’s assessment of clinical practice. It will assess your knowledge, skills and attitudes as well as reflection on key issues relating to the achievement of the competencies. It is a vital document and it should be made it available to the preceptor or supervisor(s) at all times. The competencies relating to key areas of practice and associated activities provide a framework for the learning experience. As a forensic practitioner, it is expected they use their judgment in order to assess an individual’s immediate health needs and carry out forensic examinations and interventions, whilst also being cognizant of the legal implications of working with a Detainee in a Custody setting or a victim in a sexual assault setting. The role of a forensic practitioner requires unique knowledge and skills in the collection and recording of evidence, forensic examinations and recognising injuries. The management and care of both a detainee and a sexual assault victim right through from the initial contact to possible legal proceedings requires a high level of competence. The competency document has been approved as one of the key component of UKAFN’s Advance Standards in Education and Training in Forensic Practice (ASET) and as such, successful students who fulfil the criteria of ASET, will also receive a UKAFN ASET Certificate. In order to successfully complete the module, students must achieve all elements of the competencies. It is expected the majority of learning will take place in the student’s resident place of work. However, students may negotiate opportunities to work in an alternative environment of care, for example, a mental health environment or Accident and Emergency Department (A&E). Throughout the student’s clinical practice they will be guided and supported by a designated Preceptor or supervisors(s). Who’s role is to provide an individualised learning pathway; promote the development of clinical skills and provide direction and supervision in the achievement of competencies. During your practice experience, it is important for the student to work with and learn from other health professionals. In addition to working with the preceptor, they may also be assigned a supervisor(s) who will also play a significant role in their learning. However, the preceptor is responsible for signing off each competence and the final declaration of competence. 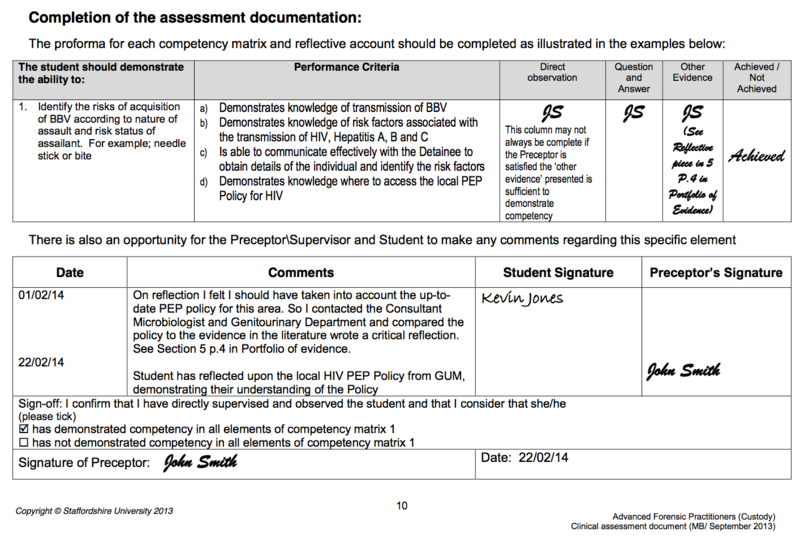 The assessment process can be informed by the opinion of other health professionals.